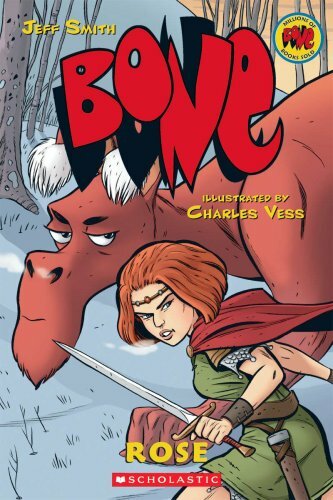 This is a tale set in the world of BONE created by Jeff Smith. It concerns Rose and Briar in their youth and so can be seen as a prequel. But you don’t need to have read any of the other books to enjoy this one. If you are familiar with the BONE series you already know what will happen. You may enjoy seeing Grandma in her youth, but the Bone family are obviously absent so this doesn’t feel like the stories you are used to. The art is great and in full colour; another departure from the original series. Many of the little vignettes are stunningly beautiful and have an olde worlde folktale feel that conjures up the perfect mood. Various creatures speak in their own tongues and are given a different colour speech bubble to differentiate the languages and who can understand them. There are also some lovely dream sequences and recollections, all expertly done. The tale is a simple one and the plot is tactfully signposted. There is also a nice introduction – lifted straight from the main series – that tells you all about the world and its impending peril. This and the fact the book is chopped into neat chapters every ten pages makes it very friendly for the novice reader. Not a must read for the Bone follower but a solid stand-alone work and a charming Thumbs Up!